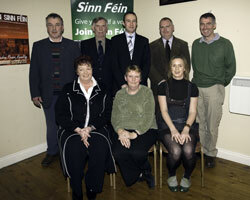 SINN FÉIN hopes to take seven town council seats in five west Cork towns in next June’s local elections, having selected its candidates at a packed convention in Dunmanway last Saturday night which was conducted bilingually. There was a great air of enthusiasm and confidence as the convention was chaired by Sinn Féin Leas Árd Runaí, Declan Kearney. Three new female and one male candidate were selected as well as three of the five outgoing town councillors to stand next June. Tributes were paid to Councillor John Desmond, who was an excellent mayor and councillor in Bandon, and Councillor Tim O’Leary of Bantry (both of whom are standing down) and former Bantry Councillor Anne O’Leary for their dedication and commitment to their party and constituents during their terms. They had all represented their communities with distinction. Noel Harrington (Kinsale), Lou McCarthy and Rachel McCarthy (Bandon), Councillor Paul Hayes and Councillor Cionnaith Ó Súilleabháin, (Clonakilty), Councillor Donnchadha Ó Seaghdha (Skibbereen), and Mary Horgan, Bantry. Sinn Féin has been growing steadily in towns throughout west Cork over the last 15 years since the first town council seat in 70 years was taken in Clonakilty. At the last town council elections, in 2004, five councillors were elected, including two in Clonakilty, as well as breakthroughs in Bandon and Skibbereen and Bantry retaining the seat it had won in the 1999 contest.